India Inc still seems to be reeling under the pressures of the economic slowdown and policy paralysis that defined the UPA regime. According to a CARE Ratings study on capital expenditure by companies between FY09 and FY14, investments in fixed assets have been on a downward spiral in the last three fiscals. 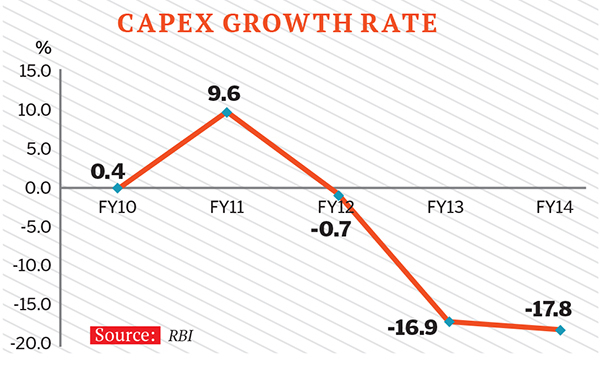 Total capex reduced from Rs 3.7 lakh crore in FY11 to Rs 2.5 lakh crore in FY14, indicating pessimism in business sentiment. Indian firms are in no hurry to change their cautious stance despite PM Narendra Modi generating a sense of optimism by bringing in capital for cash-strapped sectors like infrastructure. India will now get nearly $34 billion from Japan over the next five years for its developmental projects. In FY15, capex is envisaged to be Rs 1.24 lakh crore, less than 50 percent of that in FY14 (Rs 2.51 lakh crore), according to the report. Experts say that it will take some time before corporates become confident. “Optimism is there, but it takes time for that to get translated into action. We need to see a real change in the economy in terms of acceleration in regulatory approvals, uptake in manufacturing and production coupled with a curb on interest rates,” says Harish HV, partner at Grant Thornton. The report also shows that Odisha, Maharashtra, Gujarat and Chhattisgarh received 55.7 percent of FY14’s total capex. The power sector led by receiving 33.4 percent of the total investments; metal, textiles, cement and construction were the other major industries which attracted investments.